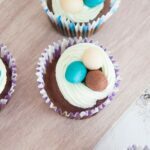 Recipe for festive, cute little vegan Easter Cupcakes! Perfect for the holidays. Colored almond paste balls remind of the eggs in an Easter Nest. 1/2 cup vegan butter Alsan, Earth Balance,.. In a mixing bowl add all the dry ingredients given above for the muffin and whisk. Mix in the wet ingredients for the muffin and whisk again until it's a nice smooth dough. Put muffin liners in a muffin tray and fill them with the dough about 3/4 full. Let the muffins cool off completely before applying the frosting. Meanwhile mix the butter along with the confectioner's sugar and the peppermint liqueur with an electrical handmixer until it's a smooth frosting. Fill the frosting in a piping bag and put it in the fridge for the meantime. Divide the almond paste in 3 equal pieces. Color one piece blue by adding food coloring into the the almond paste and kneading it until it has an even color. Roll out of every piece 12 small almond paste balls with your hands. Put the cocoa powder in a small bowl and roll 12 almond paste balls around in the bowl until they are all coated with cocoa powder. If your muffins have cooled down by now pipe circles with your frosting on the muffins. Place the little almond paste balls into the circle. Start by putting the cocoa coated ball first, otherwise it will get messy. Ready are your Easter Cupcakes! *I've used Dextrose in this recipe which is a fructose-free sugar, but you can sub it with your preferred granulated sweetener.